There are two major testing options for brother to brother tests. 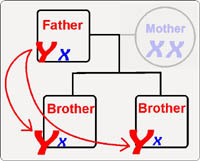 Y chromosome testing is used to see if two or more male persons have the same biological father. If you also (or only) wish to know if they have the same Mother, then you will require a Full Sibling to Sibling Test. Y-chromosome testing is your least expensive option while obtaining very high accuracy (99.9%+). If perhaps the 2 or more brothers that you want tested have different fathers that could be related, or if you want to know if the persons being tested have the same Mother, then you require a Full Sibling to Sibling Test. To have the Mother's DNA sample (from both or either brother) drastically increases the accuracy of the test.